Camping Globo Rojo är en camping i Canet de Mar, Barcelona, belägen vid havet. Campingen har platser med stängsel, med skugga och platser med lite skugga. Camping Globo Rojo ligger i närheten av en sandstrand. Det finns möjlighet att hyra husvagnar och bungalows. På campingen finns en ett sportområde. För den sportige semestervandraren har campingen olika cykelleder. Det finns ett underhållning. Campingen förfogar över en utomhusbassäng och ett knattebad. I den närliggande omgivningen kan du också simma i havet. Denna inspektör gör varje år ett besök på Camping Globo Rojo och inspekterar campingen för ca 200 faciliteter och för andra förekommande punkter. Inspektören är en medarbetare från ACSI och arbetar inte för campingen. A lovely site, well cared for by its owners and staff. We were given a very warm welcome and help was readily volunteered whether or not there was a need. A well stocked supermarket nearby. Easy access by train to Barcelona. We spent 4 nights at Globo Rojo and plan to spend a few more days there soon. A very friendly family owned campsite. The staff were able to advise on the best of tourist matters and always had time to share with us. The pitches were spacious and we were most grateful for the help in setting up the caravan on a lovely green pitch. Canet is a lovely town and only 15 mins walk from the site. A supermarket is just round the corner. Would certainly visit here again. This campsite is amazing! First we thought we would like to stay at the campsite only for two nights, but it was so nice, that we spent there a whole week. The atmosphere was lovely, and the staff very attentive and helpful. We were surprised to see how clean everything was. Lovely campsite, with helpful & friendly staff. Short walk to station for trains to Barcelona. Opposite sandy beach.5 minute walk to well stocked supermarket. Too close to a big road but no too much noise at night. We stayed at this campsite last month and it is by far the best campsite we have ever stayed at. The staff was really friendly ,the site was well maintained and kept exceptionally clean and tidy. The toilet and shower facilities cleaned regularly throughout the day. Superb swimming pool, Kids loved it. We found the nearby beach was quiet, clean and safe. Very easy to get to Barcelona city center (Bus or train). A truly top quality campsite, where order, cleanliness and service as well as friendliness simply is second to none. The year news, a saltwater jacuzzi is not less than excellence, and during opening hours 10:00 to 20:00 there are no less than two lifeguards present at both pools. We'll be happy to come back and recommend equally like everyone else to use Globo Rojo - You will not regret it. Campeggio per famiglie con molte caravan fisse annuali. Un poco disturbato dalla strada litoranea che lo fiancheggia. Fondo stradine sabbioso che in caso di pioggia incolla molta sabbia sotto le scarpe. I servizi sono belli e molto ben curati ma hanno l'inconveniente di non essere riscaldati, cosa che in bassa stagione e in caso di maltempo pesa negativamente. Vill du boka campingen Camping Globo Rojo eller få mera information? Det går bra med nedanstående uppgifter eller via campingens webbsida. 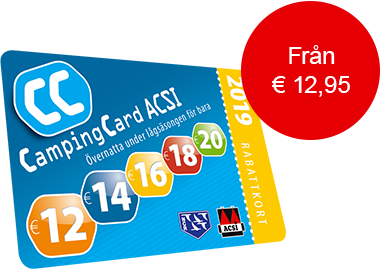 ACSI Eurocampings skickar din informationsförfrågan till "Camping Globo Rojo".